Posted <2017-04-27 Thu 15:11> by Aaron S. Jackson. Our energy supplier came today to install gas and electricity smart meters. I was not particularly interested in getting a smart meter but our house originally had pre-paid topup meters. The nearest place we could top them up was ASDA, which I am not a big fan of. Smart meters raise some privacy concerns. Variations in power consumption can provide quite a bit of useful information about which appliances are being used. As is usually the case, unfortunately convenience has triumphed over freedom and privacy. The picture below was taken while my house mate was having a shower. This amount of gas consumption in our home could only be from the boiler, since the gas hob and oven uses very little gas. The duration of such a spike can fairly accurately indicate whether someone is showering, using a tap or has the central heating on. While I have access to this information from the little Pipit 500 display they provided us with, it isn't much use for obtaining actual statistics. I've done a bit of searching on the web and found that some people are using SDR to monitor their energy consumption. The HAN (Home Area Network) component of these smart meters typically use ZigBee, which in the US is about 900MHz. Unfortunately in Europe this technology operates at around 2.4GHz. My RTL-SDR can only go to 1.7GHz so I will have to think of something else. It would be nice if the data was more accessible. If I can get access to this data, and log it, I would be quite interested in building something which can predict which of our household appliances are in use. I'm fairly certain that this can be done with reasonable accuracy. The installation was fairly quick. The engineer replaced both the gas and electricity meter within 1 hour. The Pipit 500 unit has a few issues in my opinion. 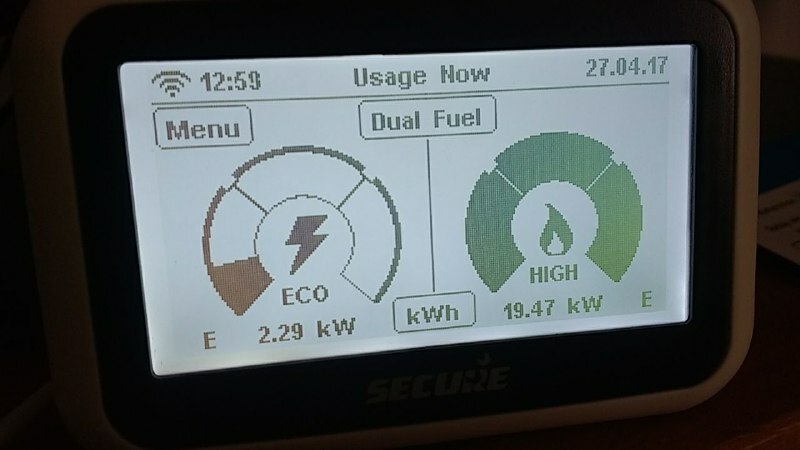 The most useful screen is the one that shows you the current energy consumption for both electricity and gas at the same time. Unfortunately, after a minute of being on this screen it changes back to a fairly pointless screen which shows you available credit. The second silly thing about it is that it has two LEDs on the top, one for electricity and one for gas. They are supposed to go Green, Amber, Red, depending on the energy usage. However, the gas considers anything over 100w as being high, so it only goes between green and red.